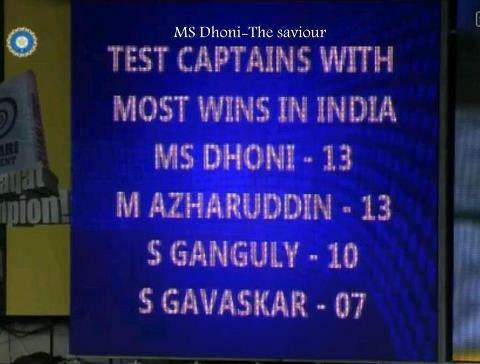 With India's massive victory over Australia in Hyderabad today, Mahendra Singh Dhoni surpassed Sourav Ganguly's record to be the most successful Test captain in India's cricket history. It was Dhoni's 22nd win in 45 Tests as captain, a remarkable winning percentage of nearly 50, and it put in the shade Sourav Ganguly's achievement of 21 victories from 49 Tests. India won by an inning and 135 runs in second test of four test series of Border-Gavaskar 2012-13 Trophy. Australia declared first innings for 237/9 then India made mammoth 503 and Australia trembled in second innings for 131 all out. Vijay, Pujara, Ashwin and Jadeja outperformed Australia.